The practice is very aware of the pressure upon appointments particularly since the start of this new-year. 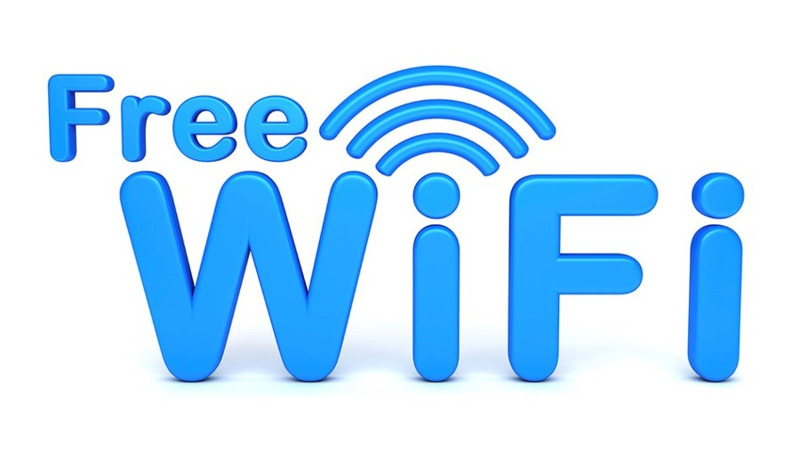 We are working to improve this so please accept our apologies if it takes you longer to access services at present. Why not join us at Parkrun on the first Saturday of the month at Wycombe Rye?- and Parkrun is on every Saturday anyway at 0900 at Wycombe Rye and hundreds of other locations in the UK (and round the world). 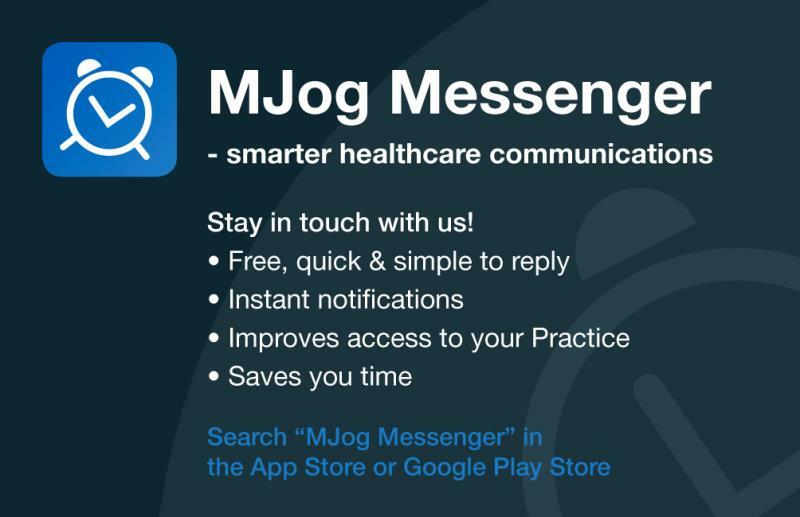 MJog Smart provides a secure, two way digital messaging service to the MJog Messenger App, delivering rich engaging health information between GP Practice and patients – 24/7, 365 days of the year. It allows patients to easily respond in a few simple clicks. Our next Parkrun outing for the Surgery will be on Saturday 02.02.19 at Wycombe Rye at 0900. Come rain or shine we will be there...at least one of us anyway! Why not give it a try? Parkrun is suitable for the slowest of runners or for walkers as the last person to complete the course is always the official Tailwalker who walks along at the back-so it wont be you. Or if you don't want to do the exercise, how about volunteering? Some of our staff regularly volunteer, either cheering people on at points around the course, or checking them in as they cross the finish line, or scanning the barcodes. Parkrunners are a friendly lot, come and join us! HUGE RISE IN FLU CASES REPORTED THIS WEEK. HAVE YOU HAD YOUR JAB? Just over 50% of our at risk patients have had their flu jabs so far this season despite all the extra clinics, a pattern seen across the UK as the mild winter and lack of deaths this year (only 41 so far) have led to a drop in vaccine uptake. The inevitable surge in cases of flu in the UK has now started with a vengeance. You do still have time to protect yourself and those around you. Just come in to either surgery and we will give you your flu jab while you wait. You do not need an appointment. We thank our other patients who may be waiting to be seen for supporting this approach. Overall the few moments waiting could save you several weeks of waiting for an appointment later if the national outbreak hits our community before those needing jabs have had them. The press are today reporting that ONE MILLION cases were reported last week - taking the total number of cases to two million this season. Flu outbreak: Number doubles to 2 million in just one week. 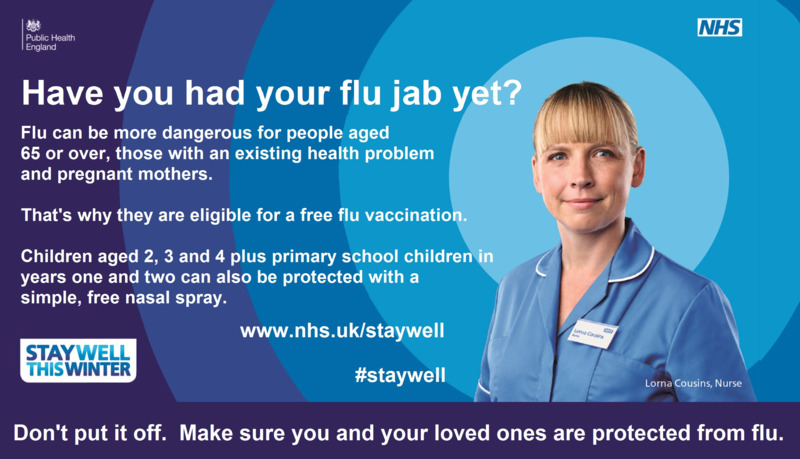 Remember, if you have any chronic illness, or care for anyone that does or if you are over the age or 65, or pregnant then you need a flu jab. Children at risk can also have flu vaccination as nose drops (see below). To enable this to work effectively the Navigation team will request a basic indication of the problem so they can then signpost the patient to the correct clinician. This isn’t a requirement but it is very likely to a delay if they are unable to use their knowledge to place the patient appropriately. To facilitate this; the team will only accept appointment requests by telephone up until 9am after which patients may do so in person. Important news form the National GP Awards 2018! 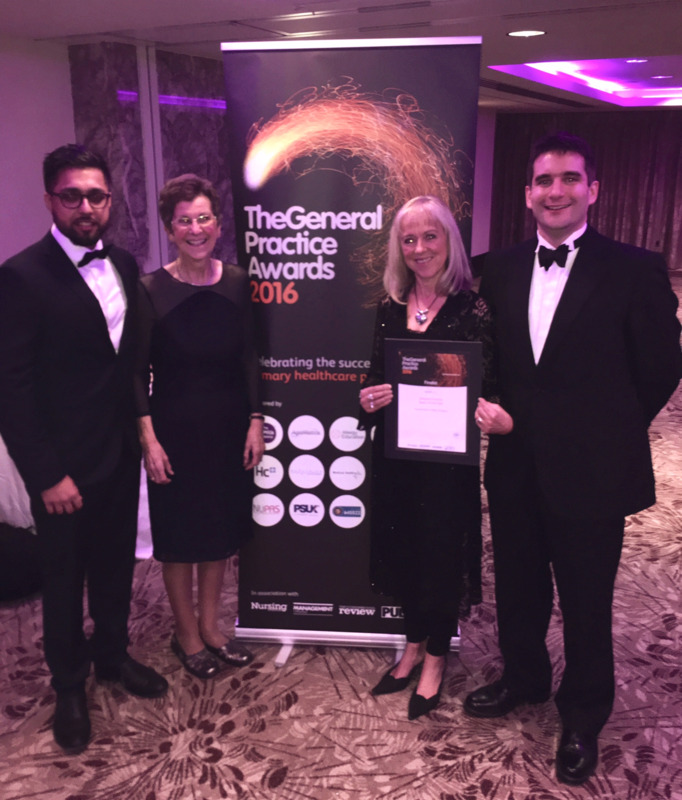 Hughenden Valley and Chequers Surgeries have found themselves in the Winners Enclosure at the National GP awards once again this year. The GP awards, now in their 10th year were described as the "Oscars of the Health Service" and gather annually to acknowledge extraordinary or outstanding excellence and unparalleled dedication to patients in all areas of Healthcare throughout the United Kingdom. This year, the biggest event yet, saw literally tens of thousands of Healthcare Professionals being considered for their dedication, drive and innovation. There many inspirational accounts of service and patient care far exceeding expectations all over the country. Several have been featured in the National and Local Press already; but of course, there can only be ONE WINNER! We are literally brimming with pride to announce that Nurse Carole Knight, our very own welfare and V.A.L.I.A.N.T. nurse has been acknowledged as the Nation's Community Nurse of the Year!! For those who work with her and for the many hundreds of our most vulnerable patients that she cares for, this accolade will come as no surprise but the truth is that maintaining this level of excellence is not easy. Very few areas of the country recognise the true and widespread value of the service that Carole spearheads yet and fewer still, not even our own region allocate any funding at all to such services. Without the unabridged commitment and outstanding dedication that Carole brings with her each and every day, the service would simply fail and any of us needing to use the Emergency Services would soon find ourselves queuing up with hundreds of additional patients. It is both heartwarming and reassuring that the care, compassion and "outstanding professional service" that Carole personifies have been recognised at such a very high level. 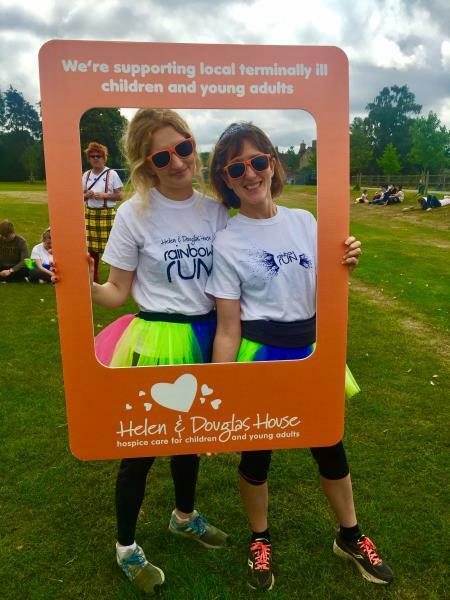 In an exciting and innovative initiative, The Hughenden and Chequres Surgery is partnering with parkrun UK to promote the health and wellbeing of staff and patients. Under this initiative, We have become parkrun practices. Our practice meets up on the first Saturday of every month at the Rye park in High Wycombe and all staff and patients are welcome to join us and We can not wait to see you there. Big Welcome to our First Contact Physiotherapist, Zoe. Zoe will see and assess all new (or flare-ups of old) musculoskeletal problems. She can refer people onwards for joint replacements if she thinks these are indicated, she can request x-rays, she can book people straight into the joint injection clinics held by Dr Hykin, Dr Jinah and Dr Wilson, she can refer people for courses of physiotherapy (NHS or private), she can refer emergencies direct to hospital if needed, she can refer to weight loss courses and many other destinations as well as making immediate recommendations for certain exercises plans according to the underlying problem. Zoe is coming to our surgery once a week, increasing to twice a week in November. She is starting at Prestwood, and in November will have a weekly session at Hughenden too. She will see people from both ends in both clinics though, and right now, there is no waiting list at all!!!! Her appointments are THREE times as long as a standard GP appointment so a thorough in depth assessment can be made. We will be displaying posters to remind people about this new service, and also our receptionists will be asking on the telephone and at the desk whether your problem is more suited to see our First Contact Physiotherapist rather than a GP or nurse. Because she provides a First Contact Service, Zoe isn't here to provide ongoing physiotherapy or old-fashioned massage type treatments and this way can keep the waiting list short or even absent. 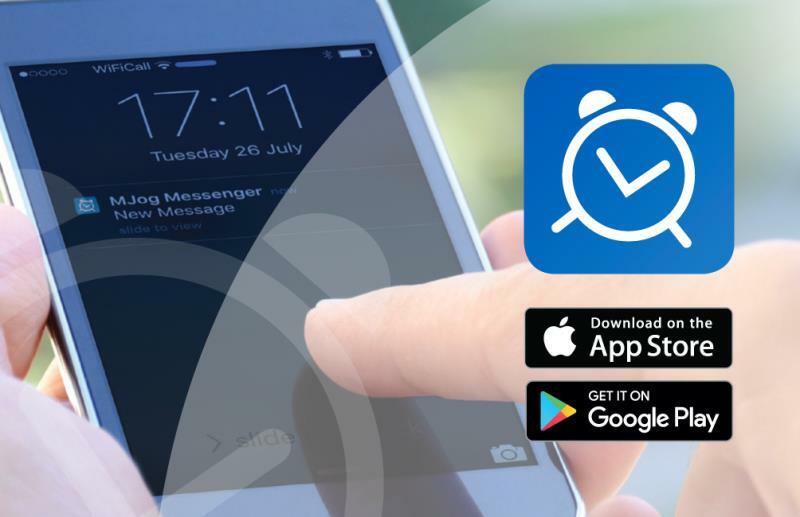 We believe that this new service will also help reduce the pressure on GP appointments and help musculoskeletal problems get resolved far quicker than has previously been the case. There have been shortages of EpiPen ® in the UK and other countries for several months. The manufacturers of EpiPen ® and EpiPen ® Junior, Mylan, are now out of stock and these supply issues are expected to continue for the remainder of 2018. The medicines regulators have agreed to extend the use-by date for some 300micrograms EpiPen ® by more than four months. Please see the table below for information on these batches and the new expiry dates. The extension does not apply to the 150 microgram version, given to children under 30kg. The medicines regulators have advised that for other batches of EpiPen ® and EpiPen® Junior you should not dispose of their expired devices until they have been replaced as it will not actively cause harm if used after the expiry. As per the normal protocol, call 999 after administration of the EpiPen ® and use the second pen if there is no improvement after 5-15 minutes. The regulators state that it is still preferable to use a device even if it has expired, rather than no device at all, if an in-date auto-injector pen is not available. Further advice from the NHS can be found in this letter or speak to your GP or pharmacist who can support you. We’re here for you for longer. Should you have the flu vaccine? 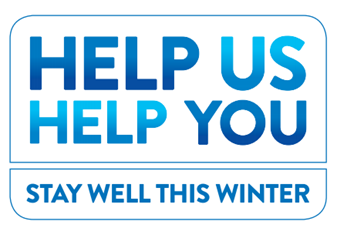 Please contact reception today to arrange your FLU APPOINTMENT. If you're a frontline health and social care worker, you are eligible for an NHS flu vaccine to protect yourself, your colleagues and other members of the community. It is your employer's responsibility to arrange vaccination for you. So, if you are an NHS-employed frontline healthcare worker, the NHS will pay for your vaccination. If you are a social care worker, your employer should pay for vaccination. Thames Valley Police is one of three forces that have been chosen to conduct spot checks on driver's vision, with the possibility of drivers losing their licence immediately at the roadside if their vision is not safe. Can YOU read a number plate at 20 meters (approximately 60 feet)? If not then do not drive until you are safe and book your eye test with your optician today. WE HAVE BEEN SHORTLISTED FOR THE NATIONAL GP AWARDS AGAIN - FOR THE SECOND TIME IN JUST THREE YEARS! "Community Nurse of the Year Award". Festivalgoers who missed the MMR vaccination 20 years ago have been urged to get the jab before the European festival season after infection rates in England tripled in a year. Measles, a highly infectious viral illness, is spread easily through airborne or droplet transmission, particularly in crowded places. Symptoms can last up to 10 days, and in few cases, can lead to serious and potentially life-threatening complications such as pneumonia and encephalitis. The MMR vaccine is available for free. Just ask at Reception and we can organise the vaccines for you. Our practice has joined forces with Parkrun UK to become a Parkrun-Practice! We are the first practice locally get involved, however, we hope that others will soon follow in our footsteps. This important national initiative is raising awareness of the positive and enormous impact on health and wellbeing that comes from participating in these events, either as a runner (or walker) or as a volunteer. Its safe, organised, free, weekly, 5k events for all ages from 4+, every Saturday morning (0900), in areas of beautiful open space. 2k junior Parkruns are for 4-14-year-olds and their families on Sunday mornings. There are now over 750 Parkrun locations in the UK. The events are organised by local volunteer teams. These are NOT races: you can walk, run, jog, volunteer or spectate. YOU can improve YOUR health and well-being through physical activity, including volunteering. Socialise, make friends and be part of a welcoming, supportive community. I have been participating in Parkrun for over three years now, and I have done over 100 runs. I was never a very active person, quite often skipping ‘games’ at school, and I didn’t take up any sport at all after leaving school. Recently though I was persuaded by my daughter to ‘get fitter’. 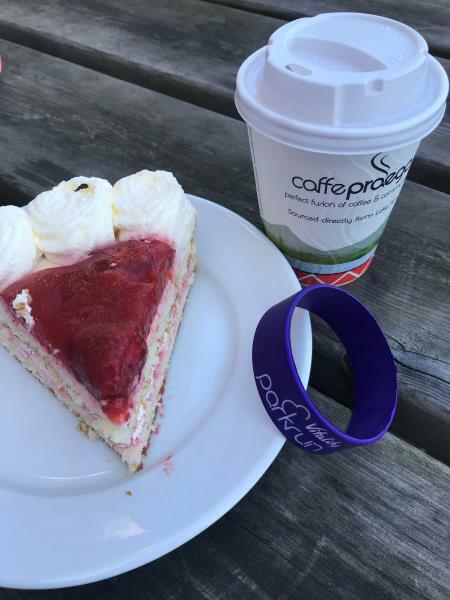 I started with the NHS couch to 5K, and having found that feasible, I then moved on to Parkrun, though I could have started with Parkrun from the beginning. My daughter has left home and can’t usually make it to our local Parkrun, so I persuaded my sister to start! I find it easier to do regular exercise when I have someone else to encourage me, but there are plenty of ‘soloists’ at Parkrun too. It is such a friendly and supportive environment. We all cheer each other on, and there are volunteer Marshalls all around the course (you could be one of these) who also cheer and clap and generally encourage everyone. No matter how slowly you go around the course, you are always lapping the person who stayed home! Now that we have become a Parkrun Practice, I have decided to change my loyalty from my usual Oxford Parkrun and come to Wycombe Rye Parkrun, alternating with Banbury Parkrun where my sister’s GP practice is based. I hope to see some familiar faces there! One final thing... there is cake! Did you know that patients with certain disabilities such as Dementia may be eligible for a discount (of approximately 25%) in their Council Tax which could be back dated to the date of diagnosis? Military staff and their families may also be entitled to similar discounts. Information can be found by clicking the Local Council Tax Discounts link. We wish to extend a huge thank you to the pupils of the 6th form at the Royal Grammar School who are fundraising to provide additional medical equipment for our patients. Thank you also to our local Residents Association who have now joined them and are supporting their efforts! It really is a wonderful example of how our tremendous community pulls together around us and for each other! 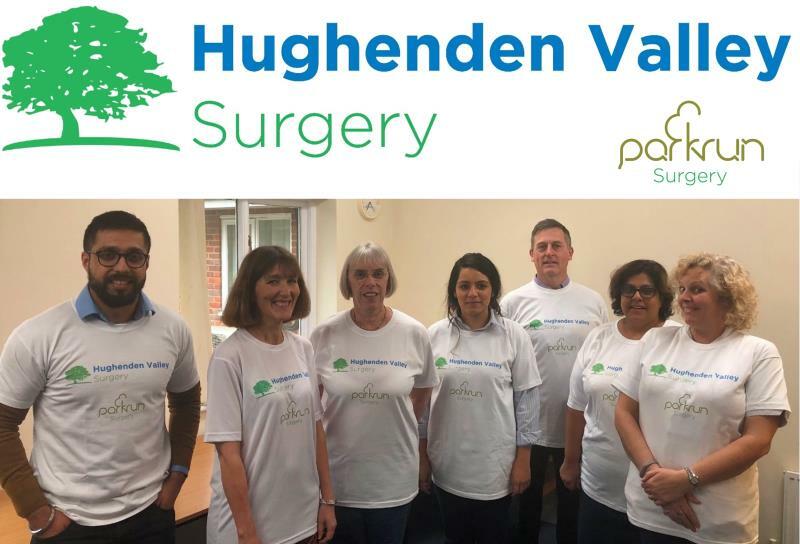 Thank you again for what you are doing from all of us at Hughenden Valley and Prestwood Surgeries! The new national GDPR regulations come into force in May 2018 and we have take steps to ensure your data continues to be used appropriately. We have published an updated Privacy Notice to be found in the 'further information' section of this website which gives more details. Following items recently in the news we can confirm that the practice has been using the quadrivalent vaccine throughout this season's flu campaign. In the event of an emergency, a wasp sting needs to be managed by the emergency services. If it is not an emergency then a wasp sting should be managed by your pharmacist. In the extremely rare event of a wasp sting needing ongoing treatment, then your pharmacist will arrange for your GP to see you. 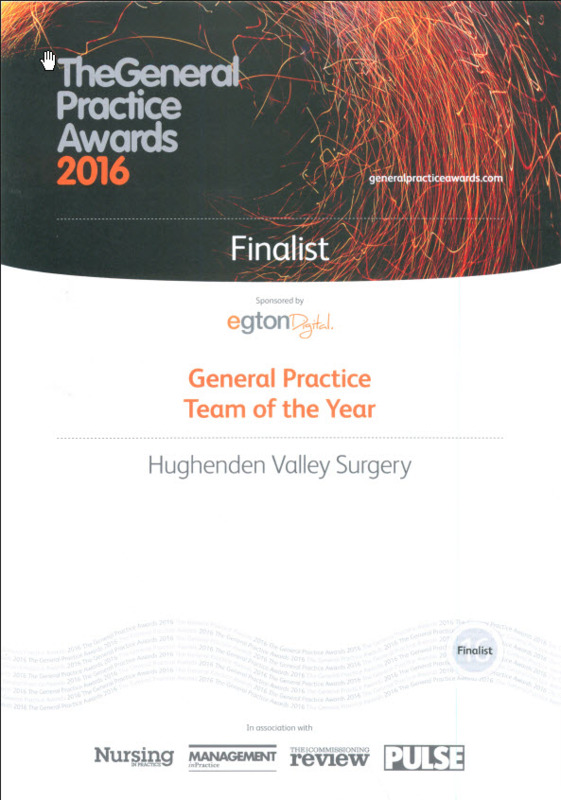 We were finalists in the "GP Practice Team of the Year"! The award went to 'Sandwell & West Birmingham Clinical Commissioning Group' who oversee 103 GP Practices in Birmingham. They are not a 'GP Team' in the strictest sense, but clearly they deserve an award. Naturally, its hard to compete with that kind of infrastructure and budget, but we could not be more proud of our team. Despite attracting one of the very lowest rates of funding in the UK we are still able to strive for and achieve excellence every day and that's entirely due to the dedication of the team that serves our patients. In the context of the NHS in 2016 this is a massive achievement. While other practices are cutting services we are still increasing them and while across the country average waiting times are up by 30% this year, we are finding new and innovative ways to buck that trend. It is commonplace now, for GP surgeries to have stopped booking any advanced appointments at all (source www.pulsetoday.co.uk June 2016). We will continue to book appointments in advance for those who need them until further notice (please remember to cancel your appointment if you no longer need it). 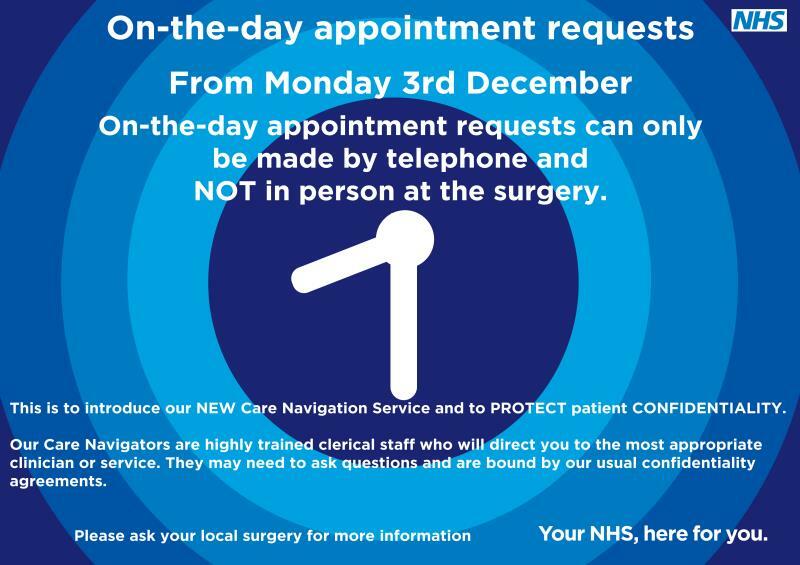 Nationally and locally surgeries are preventing access to any appointments at all without first undergoing a telephone assessment. We have decided that at this time we will not follow that trend and we have not removed our established systems, but rest assured we are under as much pressure as any other surgery. Believe it or not, it really is still the case that people book up doctor's appointments for sore throats and suspected urine infections, often with symptoms for less than 24 hours. Remember, if your child is under 5 years of age, speak to your health visitor first and if you have a minor ailment yourself then you should call 111 if you do not know what to do. We are one part of a very large NHS jigsaw. It is important that we all consider which part of the NHS we actually need before booking a GP appointment, otherwise the appointments wont be available for those people that need them. Your local NHS has set up a Minor Illness Unit in High Wycombe for people with minor illnesses. You do not need an appointment you just go there (its at Wycombe Hospital) and you do not need to book a GP appointment before going. For those who do not need to go to the Minor Illness Unit, the entire pharmacy network is ready and waiting to help you. You do not need to see your GP before going there either. We are aware that it can be frustrating if the patients in front of you need a little longer than average with the doctor. Whether you need to check your emails or just want to see what the weather is like outside without having to look out of the window, hopefully this will make your wait a little easier. Are you a young person worried about exams, or perhaps you just got your results and don't know what to do now? Feeling stressed or just need someone to talk to? "Time to Talk Bucks" is a service for local young people. They are getting positive feedback from many of our patients. 'We wanted to know what it would be like for our patients to come here. The MIIU was easy to find, being well sign-posted from the 'magic roundabout' in Wycombe. The unit was well lit and clean with helpful notices. People check in with a receptionist who takes down some basic details of what is wrong, and what GP surgery the patient comes from. The receptionist gives the patient some idea of the wait time and then the patient sits in a waiting area. There is a drinks machine, and also a water dispenser. We looked at several consulting rooms which we noticed were well equipped. There was a plaster room and there was an area where x-rays and scans can be taken. On the day we visited, patients could be seen by either a GP or a nurse practitioner of which there were several. The unit was established to provide on-the-day NHS care for those with minor illnesses and injuries. They told us that they could see and treat patients with sore throats, ear infections, hay-fever, asthma flare -ups, eczema and skin infections to name but a few of the conditions they see daily, as well as injuries such as lacerations and limb fractures. Some of the patients had been recommended to come by their own surgery, some came because they had seen information about the MIIU on posters or on the internet, and some because they had been before. Some patients came because they worked in Wycombe but lived elsewhere. Whilst we visited, we noticed about 6 people in the waiting room and observed the waiting time to be around 35 minutes. 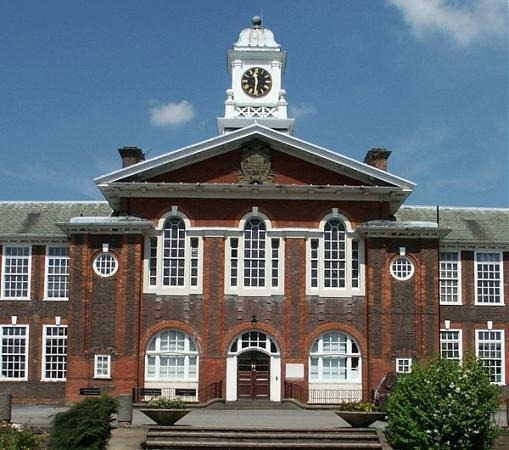 Buckinghamshire County Council has recently recommissioned the specialist sexual health services for both 'genitourinary medicine' and 'contraception'. The new service is known as B-SHAW (Bucks Sexual Health and Well-being). Having trouble getting a nurse appointment? Then please help us out. The sharp-eyed among you will have noticed that over the past few years a considerable chunk of work which used to take place in hospital is now being done in the surgery. While this is not the best place to discuss the politics as to why that has happened, the removal of most services from Wycombe Hospital has not helped us locally. Our brilliant nursing team have born the brunt of much of this increased workload, which in turn makes it really important that the appointments that we have left over are used most effectively. In the meantime we have undertaken a thorough review of the work that our nurses do and one area where we have found that we can free up resources is with the completion of health-questionnaires. Historically, these have been completed either by a nurse during a consultation with a patient, or by a patient, again during a nurse consultation. 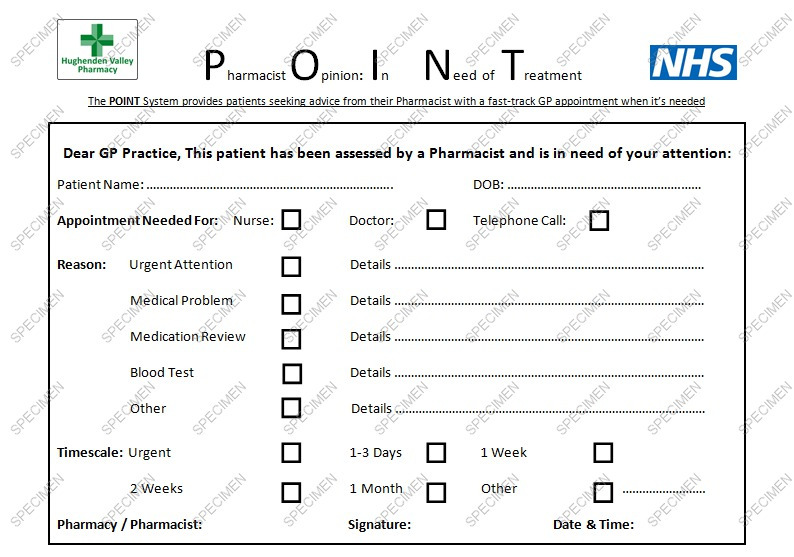 We have been trialling a new system whereby the questionnaires are completed at home, and then we make contact with patients who need to be contacted. It has gone well and we are already seeing shorter waiting times for nurse appointments. If you usually "report in" to see a nurse annually, even when entirely well, you may be asked to fill in one of our new home assessments first, so that we can make sure that despite the ever increasing pressures on the service, our resources remain accessible to those who need them. 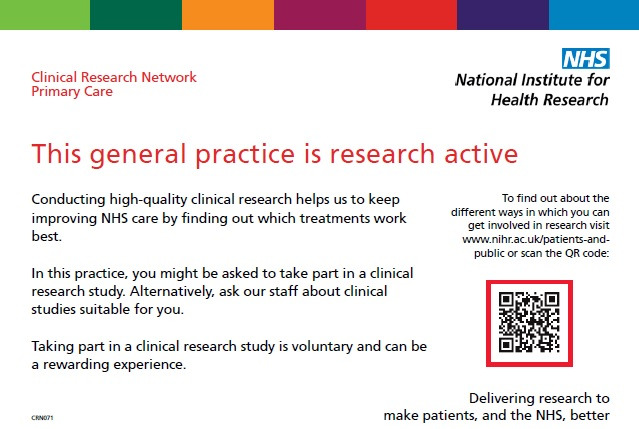 Of course we are able to offer this new service to many more patients than we could ever see during our nursing clinics, so do not be alarmed if you receive a health questionnaire from us when you are not expecting one! Its all part of the service!! Home assessments will typically be sent to you during the month of your birth, so that they coincide with your other health reviews. Again, by reducing duplication we are finding we can help more patients with the resources that we are allocated. This is an area of new development in General Practice and is likely to change with time. For now we thank you for your help in getting it going, and welcome your feedback. Exclusive Wiltshire Farm Foods Discount! Those friendly folks at Wiltshire Farm Foods have put together an amazing package for our patients. They have created "A Hand-picked pack called the ‘Hughenden Valley Pack’ which features five meals and five desserts from "the luxurious end of our range" and would usually be charged at £32.40 individually but they will offer a trial pack price of £15.00 with free delivery. Hands Only CPR - Its not as hard as it looks! 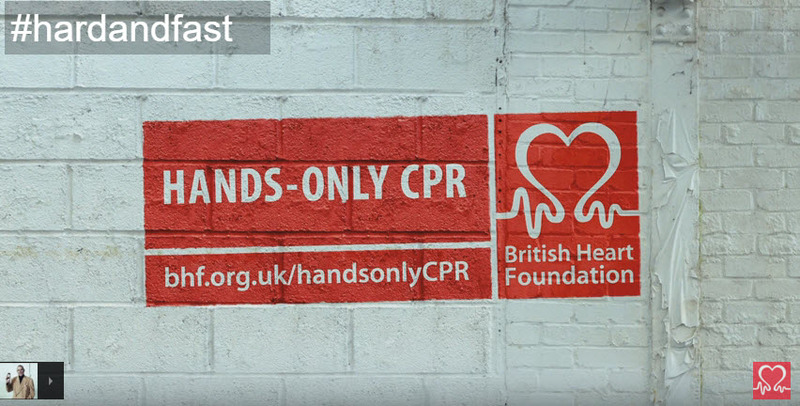 Watch the video and may be save a life..
Back by popular demand - please take out a couple of minutes to watch the British Heart Foundation's CPR video. It might help you save a life. 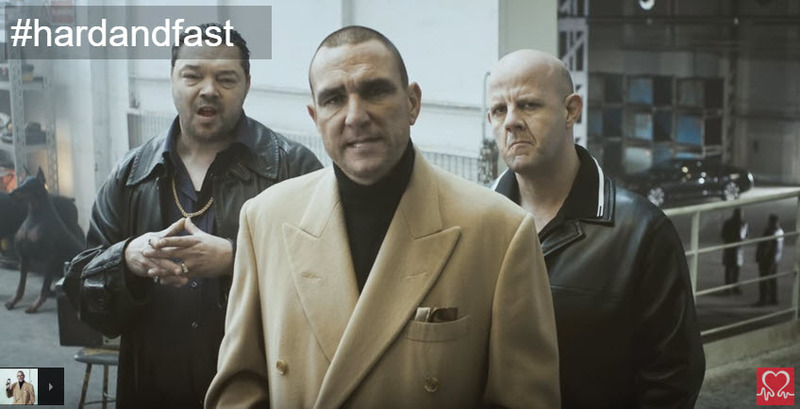 Click Here to see the video: Vinnie Jones explains that CPR is not as hard as it looks. Did you know that you can arrange a FREE fire safety assessment for yourself, someone you care for or anyone locally via the brilliant team at the Buckingham and Milton Keynes Fire Authority? 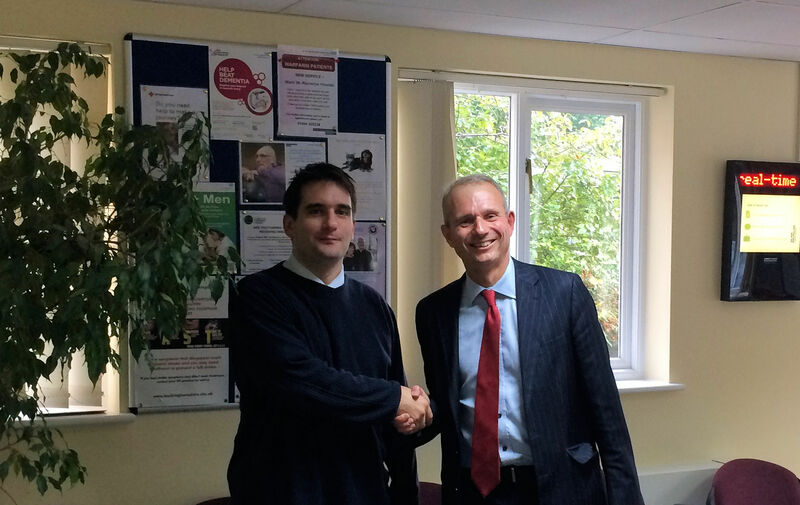 We were very pleased to welcome our local Member of Parliament David Lidington MP to the surgery. Mr Lidington (pictured on the right) enjoyed a tour of the grounds and facilities at Hughenden Valley Surgery before taking time to hear about some of the tremendous challenges that we are currently facing in General Practice.